With the outdoor season wrapping up, most of us are looking forward to hunting season, but there’s a lot of our members who don’t hunt, that are looking forward to indoor target archery season already. If you’re new to indoor archery, or new to the NFAA organization…here’s a quick intro to the basics of the different rounds. Within the NFAA family, you’ll likely have no problems finding other members that can walk you through your first target round. There are several variations to these rounds that are shot in clubs and leagues across the country, but these are the primary rounds and reflect the way competitions are conducted at a national and sectional level. This is the standard round that’s featured at the end of each indoor season in our National Championships. On the 5 spot face, archers will shoot one arrow at each spot. The white inner ring scores 5 points per arrow. The inner “X” ring is used only to break ties. The outer blue ring, although there is a light blue line within this ring, will score 4 points or any arrow in this scoring zone. An arrow need only to touch the scoring ring to achieve the higher value. 60 arrows are shot in total at a distance of 20 yards with 5 arrows per end. An “end” is the set number of arrows shot each time an archer stands on the shooting line. The total number of possible points for this round is 300. The total number of ends shot in one round is 20 ends per score with an additional two ends, prior to score, for practice. The archers may also choose to shoot a single spot target face. If the single spot face is chosen, they also gain an additional scoring zones that include values from 1 to 5 points per target. If a 5 spot is chosen, the archer may also shoot all of their arrows into any combination of spots on that 5 spot target. The 2019 Indoor Nationals in Cincinnati, OH will be held March 15-17, 2019. Register HERE. Arguably the most prestigious round in target archery, the Vegas 300 round is a 30 arrow round shot at a distance of 20 yards. There are 3 targets on each target face and the archer shoots 3 arrows per end for 10 ends. An archer can also choose the single spot face for this round as well. In doing so, the archer will gain additional scoring rings just as with the blue and white target faces. The added scoring values are from 1 to 5 points per arrow. The center of the target face on both the 3 spot and the single spot target in this round is yellow and contains a “X” ring that is used to break tie breakers, with the remainder of the yellow divided into a 10 ring zone and a 9 ring zone. The red scoring rings are next with 8 and 7 points. The last scoring ring on the 3 spot face is blue and has a value of 6 points. On the Single Spot, the blue ring is valued at 6 and 5, the black at 4 and 3, and last two white rings are worth 2 and 1 points. Just as in all other NFAA rounds, any arrow touching the next scoring zone line, will receive the higher point value. At the Vegas Shoot, archers will compete for 3 days, one 300 round per day. The shoot-offs following the rounds are used to break ties for first place in divisions where the “X” ring is not counted for a first place position. The 2019 Vegas Shoot at the South Point Hotel & Casino in Las Vegas, NV is February 8-10, 2019. Register HERE. The Classic 600 Round is a long distance indoor round. This round is generally shot on a single spot face with one target per shooter and 4 targets per buttress. There are 4 ends of 5 arrows shot at each distance. Archers shoot 20 arrows at 40 yards, 50 yards, and finally 60 yards. The target faces are similar in color and scoring zones as the Vegas round and extend to a 6 ring value, just like the 3 spot Vegas targets, but with only one target. There are no scoring values for arrows shot outside of the 6 ring. Ties are again broken by X’s and shoot-offs are held in an Olympic style format. Archers that make the cut (which varies by the number of participants) are ranked, for example, from 1st to 32nd place. The number 1 ranked archer will shoot off against number 32, 2nd against 31st, 3rd against 32nd, etc.. The shoot-offs consist of 5 arrows at a distance of 60 yards, or at the longest distance for the archer’s respective division. Ties are broken with 1 arrow shoot-offs. 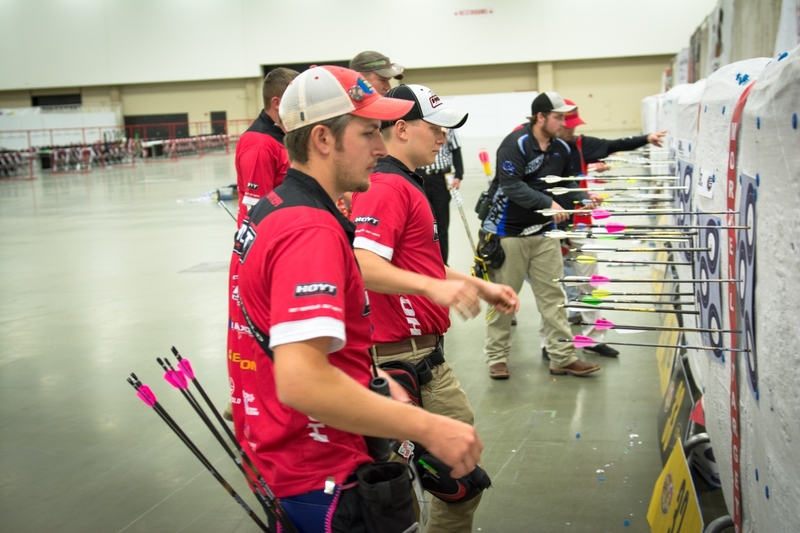 This shoot generally marks the last of the NFAA’s Indoor season each year in Yankton, SD. The 2019 First Dakota Classic hosted by the NFAA Easton Yankton Archery Center in Yankton, SD is April 12-14, 2019. Registration is not yet available but you can view more information on the event HERE.